Welcome to Night Train! Below, watch the official trailer for the Night Train with Wyatt Cenac TV show on Seeso, premiering June 30, 2016. Daily Show vet Wyatt Cenac executive produces with Marianne Ways. David Martin, Jon Thoday, and Richard Allen-Turner also executive produce. Avalon Television produces. The first season of Night Train with Wyatt Cenac features the comedy talents of Janeane Garafalo, Jen Kirkman, Roy Wood Jr., Sasheer Zamata, Hari Kondabolu, Eugene Mirman, Michelle Wolf, Aparna Nancherla, Seaton Smith, Phoebe Robinson, Larry Murphy, Scott Adsit, and John Hodgman. Questlove is among the musicians features in the standup comedy, music variety series. Watch the Night Train with Wyatt Cenac TV show trailer from Seeso. Get all the details from this Seeso press release. Emmy and WGA Award winning and Grammy-nominated comedian Wyatt Cenac brings his NYC stand-up comedy staple to Seeso on June 30 with “NIGHT TRAIN WITH WYATT CENAC,” a freewheeling mix of stand up, music and other surprises, where anything can happen and anything is welcome. The series, hosted by Cenac, features performances from comedy favorites such as Janeane Garofalo (“WET HOT AMERICAN SUMMER,” “WET HOT AMERICAN SUMMER: FIRST DAY OF CAMP”), Jen Kirkman (“CHELSEA LATELY,” “AFTER LATELY”), Roy Wood Jr. (“THE DAILY SHOW WITH TREVOR NOAH,” “SULLIVAN & SON“), Sasheer Zamata (“SATURDAY NIGHT LIVE“), Hari Kondabolu (“TOTALLY BIASED WITH W. KAMAU BELL“, “JOHN OLIVER’S NEW YORK STAND UP”), Eugene Mirman (“BOB’S BURGERS,” “FLIGHT OF THE CONCORDS“), Michelle Wolf (“LATE NIGHT WITH SETH MEYERS,” “THE DAILY SHOW“), Aparna Nancherla (“LATE NIGHT WITH SETH MEYERS”), Seaton Smith (“MULANEY“), Phoebe Robinson (“GIRL CODE“), Larry Murphy (“BOB’S BURGERS”), Josh Gondelman (“LAST WEEK WITH JOHN OLIVER“), Scott Adsit (“SATURDAY NIGHT LIVE”), and John Hodgman (“BORED TO DEATH“), among many others, including musician Questlove (“THE TONIGHT SHOW STARRING JIMMY FALLON“). The series is Executive Produced by Cenac and Marianne Ways, and is produced by Avalon Television. David Martin, Jon Thoday, and Richard Allen-Turner also Executive Produced the series. Seeso is the new, ad-free streaming comedy channel from NBCUniversal’s Digital Enterprises. The channel gives comedy viewers access to over 2,000 hours of original programming, with new, original content rolling out daily. Viewers are able to access the curated library for $3.99 a month via www.seeso.com, iOS, Android, Chromecast, Roku, Amazon Fire TV and Fire Stick as well as Amazon Instant Video. What do you think? 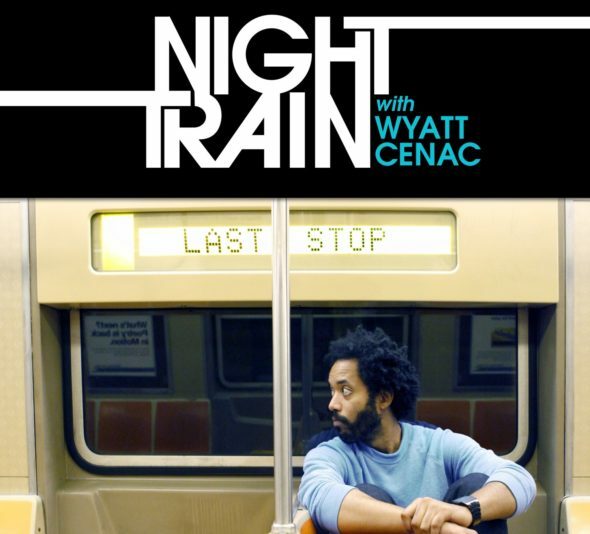 How do you like the sound of the Night Train with Wyatt Cenac TV series? Do you plan to watch the first season on Seeso? More about: Night Train with Wyatt Cenac, Night Train with Wyatt Cenac: canceled or renewed?, Seeso TV shows: canceled or renewed?